Okay, this post is for me and to let everyone who is looking for a page or two that are no longer there, that my latest backup for this website was two months ago, and guess what? I had to restore using it, so, the last two months of posts are gone. I could probably recover most of them using Google, but, if people want to see them that bad, the may still be able to look at Google’s cache of them. So, heck with em, I guess we’ll just act like I didn’t post anything for the past two months and leave it at that. So, make sure you backup you morons! If you purchased a system with Windows Vista Home Basic or Premium installed, you may be surprised if you try to restore a file using the Previous Versions feature. 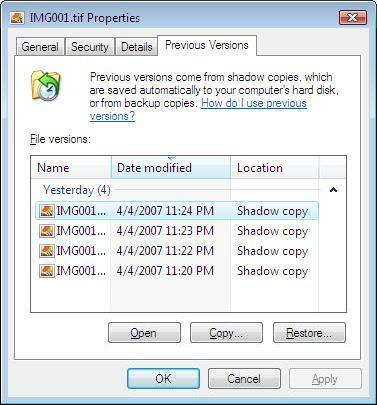 Apparently, you will need to upgrade to Vista Business, Enterprise, or Ultimate before you will be able to use the Shadow Copies that are created by the Previous Versions feature. Isn’t that lovely. Now, I know everyone is thinking, if Vista keeps a backup copy of my files, what happens when I have to delete a file I need to get rid of? Well, looks like you might be stuck, as Vista will keep the hidden copies of your files, unless you disable Volume Shadow Copy, and that will, in turn, disable your ability to use the system restore feature! But, in doing so, you will actually be able to delete the hidden copies of your files now. So, turn off system restore, delete the file, empty the recycle bin, do a little disk cleanup and turn system restore back on. The main disadvantage to this is the fact the Windows will delete all of your old system restore files, so, you will only be able to restore files going forward from when you turned it back on. They also note that the system restore files are huge compared to Windows XP, with some being 400 times bigger, and one they had on their system was 8 gigs! That will eat up hard drive space pretty quickly, hopefully Microsoft will set the default space setting for system restore pretty low. On their system, it ate up about 15% of the drive. This could be a good feature for some people who do computer forensics, if people don’t realize that Windows Vista is keeping the copies, then there may be some pedophiles who get caught because they were “using” this feature. I like that. I probably won’t buy a Home version of Vista anyway, but there are lots of people who will because they can get it cheaper. This makes two bad stories for Vista and Microsoft today, wonder what is coming next? In another post on the PC Pitstop site, they end with a nice little paragraph about a new version of Vista Microsoft should be selling. Apple has added some new and very welcome features in iTunes version 7, one at least they didn’t allow before. Previously they would not let you sync your iPod with more than one computer, sure I know it was possible, my 12 year old did it with several of his friends, but it wasn’t supported. Now, you can reverse sync and they are pushing it as a feature. Say you have a home pc and your iPod already synced, now you can take it to your work pc and sync it up with your iPod, but it only works with music and videos purchased from iTunes. You can now backup the music from your iPod straight to CD or DVD. iTunes 7 has really breathed some new life into that venerable jukebox software. One of the most useful new features is ‘Back Up to Disc,’ which is located under the ‘File’ menu of iTunes. This feature allows you to back up all your tracks to either CD or DVD. Sounds great, right? But is it easy? Yes, yes it is. Read on for a detailed step by step tutorial. Visit The Unofficial Apple Weblog for the complete set of instructions.